Pet Shop Boys oft-forgotten feature film It Couldn't Happen Here is having an exclusive screening in London, 30 years after its initial release. The film will be shown at Regent Street Cinema on the 14th of December and will be followed by a Q&A session with director, Jack Bond. The film was originally planned to be an extra long music video, showcasing the groups 1987 album Actually. 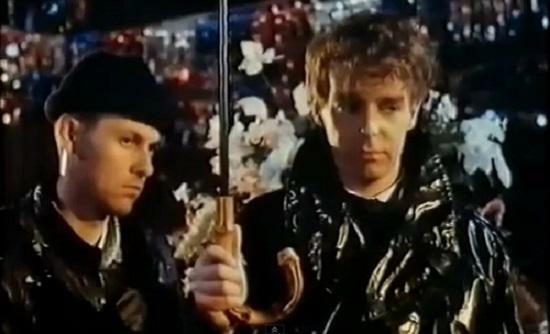 Instead it became a humorous yet ominous, surrealist movie, featuring Neil Tennant and Chris Lowe playing themselves. Following its release in 1988, the film received mixed reviews and had limited cinema showings. It was also never released on DVD, making this screening, a rare opportunity for PSB fans. As the critic Anthony Nield wrote in this Quietus feature, "What other film offers up muscle men, mud wrestlers, thigh-flashing nuns and the fleeting glimpse of Neil Tennant in a tasselled gold lame suit?" You can find out more here.